Back from the archives, ready for a new round of listeners, is Mark Carnes, Professor of History at Columbia University, and the creator of a pedagogy known as “Reacting to the Past”. 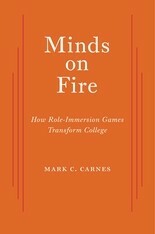 He’s also the author of Minds on Fire: How Immersive Games Transform College. He and Al Zambone discuss college as professors like to think it is, versus how it really is, and how Carnes sees immersive games as a way of bridging that rather large gap.